The women of Wells worked hard taking care of their families, but also were active in running businesses in town. They stuck together because they had moved long distances from home and their husbands worked long shifts at the mines. Irma Rowlands, a young wife during the early 30s said "These were happy years for my sister and I, as we helped one another through childbirth and illness and joined in the community activities"24. 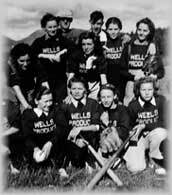 Recreation and leisure were popular in Wells, and women enjoyed snowshoeing, skiing, softball, curling, and were, of course, very popular at the community dances.